There’s no guarantee that any given verse in the Buddhist scriptures was actually spoken by the Buddha. There was inevitably some editing of the teachings as they were passed on by word of mouth from generation to generation, and there’s also evidence of tampering by monks who were pushing particular agendas. But we can safely assume that most of the early scriptures that have been passed down do reflect the kinds of things the Buddha said, if not in his exactly words. And some — possibly a lot — may consist of pretty much exact quotes. The earliest strand of texts we have available to us are known as the Pali canon. There were originally other canons (closed bodies of texts generally accepted as genuine) that were just as old as the Pali texts. Those were in different Indian languages or dialects. But they were mostly destroyed. 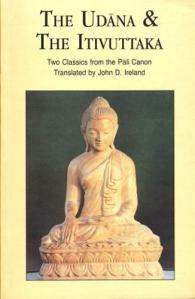 The Pali canon is as close as we’re going to get to the Buddha’s early teachings. So here we go. I’ll start with the most readable texts. 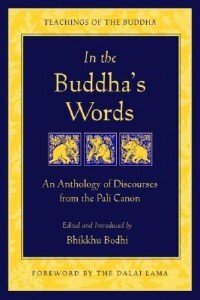 This is a truly excellent collection of extracts from the Buddha’s teachings, translated by Bhikkhu Bodhi, an American-born monk who is undoubtedly the finest and most prolific living translator of Pali. He organizes the extracts by themes (“The Human Condition,” “Mastering the Mind,” etc.) and introduces each section with a readable and informative essay. Then there are some texts which are accessible because of their very brevity. 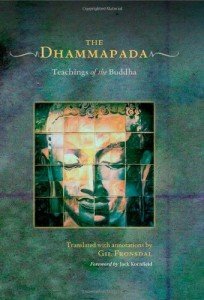 There are many, many translations of the Dhammapada, which is a collection of aphorisms by the Buddha. Some of them are not strictly “translations” but are “renderings” by people who didn’t even understand any Pali. Imagine reading a science textbook translated from Russian by someone who didn’t speak the language, and you’ll get an idea of how useful those are. And there’s no such thing as a perfect translation, but some are darn good. 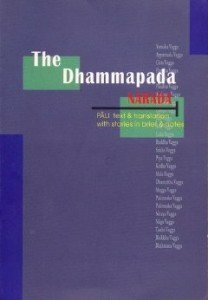 I’m very partial to Narada Thera’s translation, which unfortunately seems to be out of print, although if you can pick up a second hand copy, do so. I’ve used this one extensively, and although Narada has a tendency to make the Buddha’s words a little more “monkish,” he’s generally a very faithful translator. I haven’t used this translation much, but the parts I’ve dipped into have struck me as very faithful to the original. I’m impressed by this version and want to explore it further. It’s available on Amazon, of course. 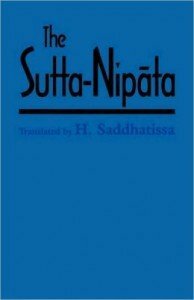 The Sutta Nipata is composed of longer, although still quite short, teachings. Some of them — especially those toward the end — are exceptionally fresh and “alive.” There’s a real sense of stepping into the world, and even the mind, of the Buddha. Available on Amazon. The Udana and Itivuttaka, Tr. John Ireland. These two texts are generally acknowledged to be among the oldest Buddhist texts. The Udana combines short records, usually of encounters the Buddha had with questioners, and “inspired utterances” (the meaning of “udana”) in verse. The Itivuttika (“This was said…”) is also a collection of prose and verse, said to have been preserved by the female lay-disciple Khujjuttara, from talks the Buddha gave in Kosambi. Available on Amazon. The Middle Length Discourses are, well, middle length. This is technically known as the Majjhima Nikaya. 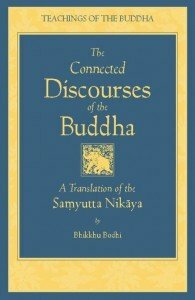 Usually these suttas are several pages long, and often include a bit of the background to the Buddha’s discourse, telling you where he was, who he met, and how the conversation unfolded. 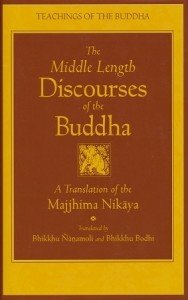 The teachings are often quite technical, and I wouldn’t recommend this for the absolute beginner to Buddhism, but if you’ve read some modern texts and want to take your understanding of Buddhism deeper, this is a great text to start with. The endnotes are very informative. Available on Amazon. 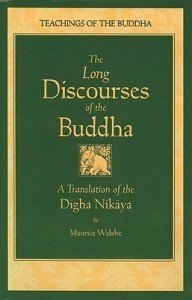 As the name suggests, the Long Discourses (Digha Nikaya) are longer than the middle length ones. They’re often very technical and repetitive, but this is a must-read for the serious student of Buddhism. Again, the endnotes are very informative. Available on Amazon. Did I mention that Bhikkhu Bodhi is prolific? Really, give that man a medal! The Anguttara Nikaya is a huge collection of shorter teachings, organized by number. There’s some facinating material here, among all the repetition. This again is a must-have for the serious student of Buddhism. And of course it’s available on Amazon. Yes, it’s the indefatigable Bhikkhu Bodhi again! The Samyutta Nikaya is similar in size to the Anguttara Nikaya — it’s a huge book, in other words — and it’s similarly composed of many short passages, but this time organized by topic rather than by number. And yes, this is a must-have for the serious student, and it’s available on Amazon. OK, that’s all for now. I’ll be adding some Mahayana Sutras later. 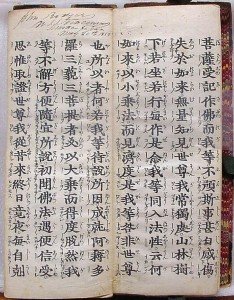 The Mahayana Sutras were composed, and not just recorded, centuries after the Buddha, and probably don’t contain anything that he directly said, but they are often profound teachings, and in some cases they preserve teachings, like shunyata (emptiness) that the Pali compilers recorded but didn’t seem to have much interest in exploring and perhaps didn’t understand. Great Selection some of the favorite in there!